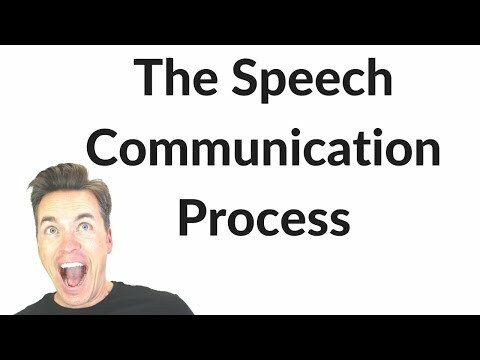 This video explains the Speech Communication Process as described in the Art of Public Speaking by Stephen E. Lucas. This is the most commonly discussed model of communication in introductory communication courses. The speech communication process is a useful model to help understand what goes on when one person talks to another. It includes seven elements: the speaker, message, channel, listener, feedback, interference, and situation. It all starts with a speaker. In public speaking, this is typically you. The speaker is the person who is presenting the oral message to a listener. The message can be affected greatly based on the speaking style of the speaker, the credibility of the speaker, and also how the speaker relates to the topic being discussed. The message is whatever a speaker communicates to someone else. This message includes both what you say verbally as well as how you say it nonverbally. The message is effected by organization, vocal and physical delivery, and the making sure that the nonverbal delivery doesn’t distract from the verbal message. The channel is the means by which a message is communicated. This might be the telephone, or it could be snapchat, or it could be face to face. The channel can effect the message in many ways, for example if nonverbal expressions were important but the message was delivered in audio only, then this would change the way it is interpreted. The listener is the person who receives the communicated message. Everything the speaker says is filtered through a listener’s frame of reference, the total of his or her knowledge, experience, goals, values, and attitudes. No two listeners have the exact same frame of reference. To be effective, the speech needs to be audience centered. So in order to be effective, you need to find areas that listeners find important and focus your speech there as much as possible. Feedback is the messages, usually nonverbal, sent from a listener to a speaker. When giving a speech you might see smiles coming back to you from your audience. This feedback influences the way the speaker continues with the message. Interference is anything that impedes the communication of a message. It can be external or internal. External interference would be something like a sound outside, or having a really hot or cold room. Internal interference might be if your audience members are hungry or if they might be thinking about problems at home. The situation is the time and place in which speech communication occurs. All audiences have some expectation of what will happen during your speech. If the speech is at a graduation, the audience has an idea of what it will be like. Similarly, if the speech is in a classroom during the informative speech section of a public speaking class, then the audience has an expectation of generally what will happen.